Featuring a hot tub Welch Pet Friendly Cabin is situated in Carnelian Bay. Guests staying at this holiday home have access to free WiFi. The holiday home has 4 bedrooms a living room and a kitchen with a dining area. A flat-screen TV and a DVD player are provided. The holiday home offers an outdoor pool. BBQ facilities is available for guests to use at Welch Pet Friendly Cabin. 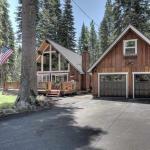 Reno is 40 km from the accommodation while South Lake Tahoe is 34 km from the property. Reno-Tahoe International Airport is 40 km away.